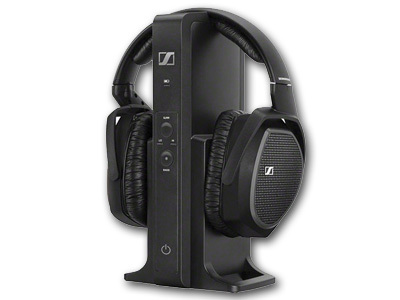 Super Sennheiser Clearance Sale ... one left at this price! Giving you access to personal virtual surround-sound, the RS 175 Digital Wireless Headphone System from Sennheiser consists of a pair of HDR 175 headphones, and a TR 175 transmitter. The TR 175 features an analogue 1/8" stereo input along with a digital optical input for connectivity to a variety of audio and home entertainment systems, and functions both as a transmitter and charging station for the headphones. You can connect up to 2 headphones to the TR 175, by using an additional set of HDR headphones (not included). The HDR 175 headphones have a closed, circumaural design, and have dynamic bass boost and virtual surround sound modes, allowing you to customize playback. Analogue and optical audio cables are included, along with 2 AAA rechargeable batteries. Box Dimensions (LxWxH)	10.1 x 9.5 x 5.9"